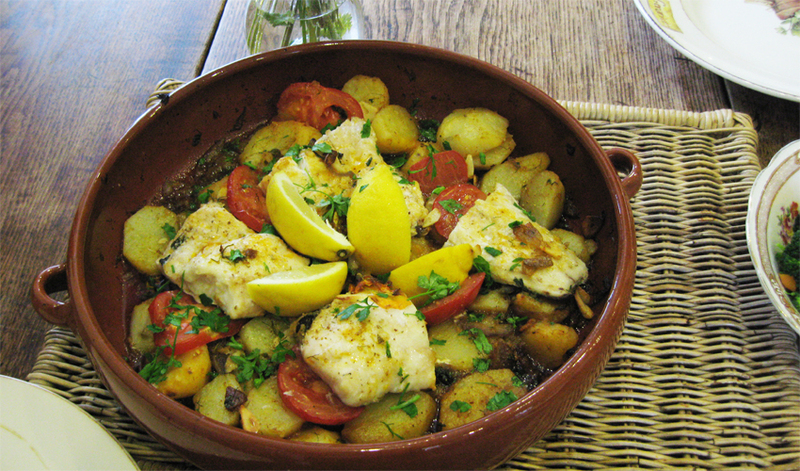 This is one my favorite fish dishes and is just like my Grandmother used to make while we were growing up in Spain. Merluza is Spanish for Hake, a white fish caught off the coast of Scotland, among other places. This is delicious and simple to make, ideal for a dinner party or special occasion. I, personally, need no excuses to cook a dish from my childhood and indulge in nostalgia in the process! Hake is also very cheap in the UK, adding to the dish’s excellence. Par-boil the potatoes and sliced onions in a pan, season with a little salt and drain when ready. This might take around 10 minutes. In the mean time, using an oven-proof dish large enough for the job, put the olive oil and garlic in the oven to heat up. This will allow the garlic to infuse the oil. When the garlic is sizzling away, add the paprika. This in turn will also sizzle and, when it does, give it a little stir and add the parsley. Drain the potatoes and gently fold them into the flavoured oil, being careful not to brake them. Level them out in your dish. Lay the thickly sliced tomatoes on top, then take the Hake and sit the 4 pieces on top of the potatoes, seasoning everything well with salt and pepper. Drizzle some of the lovely coloured oil from the bottom of your dish over the fish and return the whole lot to the oven. Depending on the thickness of your fish fillets, cook for approximately 15 minites. This dish is simple and, as such, relies on good seasoning and g0od ingredients to bring out the flavour. It’s worth buying the best potatoes you can for maximum flavour and the freshest fish you can get your hands on. Serve straight from the oven with some lovely crusty bread and a salad. Hi, yes cook it open. I ate a version of this recipe in A Coruna this year and it was delicious. Your menu says to par-boil the onion but not what to do with it afterwards. Presumably add it to the main dish along with the potatoes? 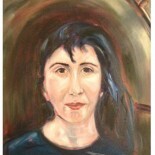 This entry was posted on June 24, 2012 by mariajoseponte in Recipes. Portrait of an Artist, sir Peter Blake.